A Singapore Airlines Airbus A330 carrying 182 passengers and 12 crew lost power on both engines on May 23 while at 39,000 feet altitude about 140 miles south of Hong Kong. The flight was enroute from Singapore to Shanghai. The aircraft then descended about 13,000 feet before normal operation was restored to both engines. After normal power was restored, the aircraft climbed back up to 31,000 feet and continued onto its destination without further problems. Any time an event results in problems in two independent systems such as engines, the search for causes must consider factors that are in common. This would include factors internal to the aircraft such as fuel or bad commands from the autopilot or pilots. External factors can include things like turbulence, water ingestion or even volcanic dust. A volcano did in fact erupt in Southern Japan recently, but this event happened before the eruption so dust ingestion is not being considered. In a company statement it was noted that the aircraft did report that it had entered an area of bad weather and turbulence before the power loss. It's also important to note that the company statement was careful to use the term "loss of power" as opposed to shutdown or what pilots refer to as "flameout". Another interesting item in the story is that the aircraft was then on the ground for only four hours before departing for its return leg to Singapore. I'm wondering what the passengers on the return flight thought after reading that the airplane they rode on was almost a glider over the China Sea? That was a helluva gamble to fly the airplane on a revenue flight after an event like this. The aircraft arrived in Shanghai after the event at about 11pm local time. That means that the contract maintenance mechanic called out to look at the airplane was the graveyard shift guy. Probably the least experienced mechanic available. I would guess that they ran the engines for a few minutes and queried the onboard electronics for error messages before clearing the aircraft for flight. A more in depth inspection would involve a partial teardown of the engine to inspect internal and hot section components. Obviously, such an inspection was not accomplished. But I'm no engine expert. Perhaps a computer upload of engine control codes was made to Rolls Royce, the manufacturer, and it was determined that the engine rollback was due to an explainable occurrence not likely to happen again. The difficulty is that there are many things that can happen to an engine at altitude which are not reproducible on the ground. There could possibly have been fuel icing or a failure of variable guide vanes or any number of other malfunctions. Jet engines may seem like large brutish machines but they're actually rather finely tuned precision devices. And they're designed to work over an extreme range of operating conditions from sea level and 100 plus degree air to pressures and temperatures where no human could survive on the edge of space. Tolerances on the huge fan blades you see spinning inside the cowling are so fine that the inside of the engine is coated with what's known as an ablative ring, which is actually designed to make contact with the outer edge of the fan blade under certain conditions and to rub off. If the hot section of the engine where the fire burns is the heart, then the brain is the fuel control unit. A complex and computerized hydro-mechanical contraption, it might be roughly compared to a carburetor or fuel injector on your car. But that comparison is analogous to comparing a first generation calculator to the latest iPhone. They're given fancy names like EECs (electronic engine controls) or FADECs (full authority digital engine controls). Taking pressure, temperature, flight regime, fuel density, and a multitude of other inputs, the fuel control unit is charged with keeping the engine producing the commanded amount of thrust while simultaneously preventing either flameout from fuel starvation or conversely what's known as overboost when the RPM or other parameters exceed design limits. If you've ever spent an afternoon at the drag races you might have an appreciation for the challenge. As the top fuel dragsters approach the starting line, they always appear to be vacillating between stalling out and running full out. That isn't too far off the mark of what the fuel control unit is attempting to accomplish while at extreme altitudes. Don't Monkey With the Throttles! It is well known to all pilots that when you are in the high altitude regime, you just don't monkey with the throttles too much. That means no rapid movements. While at lower altitudes it is possible to take the engine from idle to full thrust quickly with little problem, at altitude (above, say, 35000 feet) bad things may happen. Being designed to not flood the engine with fuel when the throttle is rapidly pushed forward, an engine may not respond to commands after being retarded to idle. Or if it does respond, it might do so sluggishly. Why might an engine be pulled to idle while in cruise at 39,000 feet? Well one reason might be because the airplane wandered into a storm or encountered turbulence. One type of turbulence called "wave" turbulence can result in the airspeed rapidly increasing or decreasing. Without a lesson in aerodynamics, all aircraft have both minimum and maximum airspeeds while in flight. The higher the aircraft flies, the closer together these two speeds become. At extreme altitudes where aircraft like the U-2 fly, the difference may be only a few knots between stall speed and maximum mach. Go too slow and the airplane stalls and falls out of the sky. Too fast and an exceedance of maximum mach may result in a loss of control or structural damage. So after encountering wave or other turbulence, a rapid increase in airspeed may occur and the autothrottle system may be too slow to respond. In this case the throttles must be manually pulled back to prevent an overspeed. Quickly after that, the wave action may cause the airspeed to then rapidly decrease. At this point, jamming the throttles forward again may result in a very sluggish response from the engines. To keep the airplane from stalling at this point, the only choice is to descend. This is where the fun really starts. Because if the turbulence is due to a thunderstorm which you may be attempting to top, the only way to go is down into the storm. At this point, the engines may be forced to ingest huge amounts of rain while enduring greater turbulence as descent continues. The story of airplanes losing power and then being forced to descend into a storm they were trying to top is a common one in mishap history. How to avoid all this nastiness? Well the old aphorism states that the superior pilot uses his superior judgement to avoid situations requiring his superior skill. This means planning and avoiding areas of known convective activity (thunderstorms) or turbulence. My airline will route us hundreds of miles out of our way to avoid moderate or greater wave action. When transiting such an area, it can also be a good idea to descend a few thousand feet into thicker air so aerodynamic and engine margins aren't so critical. And stretching the limits to top a storm which should be circumnavigated is never a good idea. Is this the scenario which happened here? It may be difficult to find out exactly what happened as it seems Singapore Airlines didn't think there was a problem with the airplane to put it directly back into service. Also of note is that the engines on this aircraft were nearly new. The airline is attributing the power loss to turbulence while passengers aboard the flight reported no interruption in inflight entertainment systems meaning that the generators never fell off line. This is an indication that the engines merely rolled back and did not flame out. 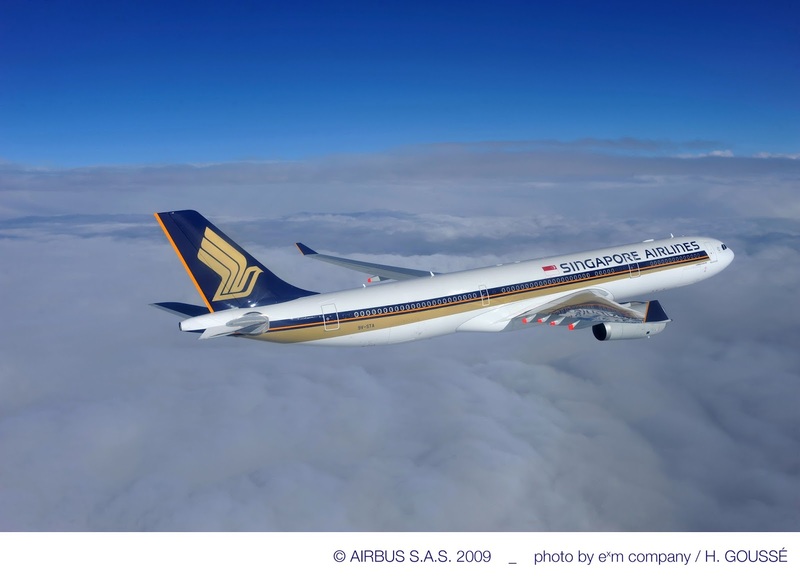 The Singapore Air Accident Investigation Board is investigating the incident while Airbus and Rolls Royce, the airframe and engine manufacturer are cooperating in the investigation. Stay tuned.